When it comes to bathroom flooring ideas, moisture should be at the top of your list of discriminating concerns. Moisture levels are notoriously high in bathrooms. 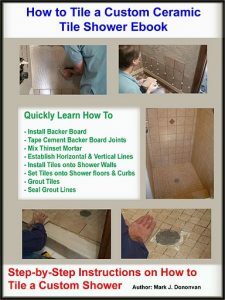 Consequently bathroom flooring ideas should be limited to options that are less sensitive to moisture damage, and that can be more readily cleaned to prevent mold and mildew growth. Not surprisingly at the top of the list for bathroom flooring ideas is ceramic tile. Ceramic tile bathroom floors look beautiful, are relatively inexpensive, and are impervious to water damage. In addition, ceramic bathroom floor tiles are available in a wide assortment of shapes and sizes, colors, and patterns. In addition, there are many grout colors to choose from to help mix up a bathroom floor design even further. Though ceramic tile is the perfect bathroom flooring idea, it can be a bit cold on the feet and slippery. Using inexpensive throw rugs and smaller ceramic tiles can help to provide a warmer feeling floor and prevent slippage. In addition, ceramic floor tiles are available today with textured surfaces to prevent slippage. Second on the bathroom flooring idea list is vinyl. Vinyl flooring, at least where the seams are not located, is waterproof. Vinyl flooring is also very inexpensive to install, especially vinyl bathroom floor tiles. Most moderately handy do it yourself homeowners can install vinyl floor tiles in a bathroom over a weekend. Similar to ceramic floor tiles, vinyl is available in a wide variety of patterns and styles to choose from. The only down side with the vinyl bathroom flooring idea is that sheet vinyl has the tendency to lift up near the edges, and vinyl tiles have the tendency to lift up over time. Stone is another good bathroom flooring option as again it is immune to water damage. Stone bathroom flooring materials include Marble, Granite, and Limestone. Stone bathroom flooring is very expensive, however, and consequently is not considered a viable option for most homeowners. The other concerns with the stone bathroom flooring idea are that stone has the tendency to be slippery and is cold on the feet. If you prefer the wood floor look in your bathroom then engineered wood flooring is the way to go. Solid wood flooring, and particularly laminate wood flooring, are simply too susceptible to water damage to be considered good bathroom flooring options. Engineered wood flooring is comprised of a real wood finish on its top layer, and a plywood base layer that is moisture resistant. 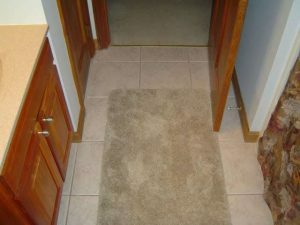 The carpet bathroom flooring idea, simply put, should not be an option. Carpeting is highly moisture sensitive and is difficult to clean, thus leaving it highly susceptible for mold and mildew growth. So carefully consider these bathroom flooring ideas, as well as your budget, prior to making a decision on your bathroom flooring choice. Fortunately there are plenty of bathroom flooring options to choose from to fit almost any bathroom flooring budget.